For other uses, see Texcoco. This article is about the pre-Columbian city-state. For the modern municipality and city, see Texcoco, Mexico State. For the lake, see Lake Texcoco. The Valley of Mexico at the time of the Spanish conquest, showing Texcoco in relation to Tenochtitlan and other cities in the Valley of Mexico. 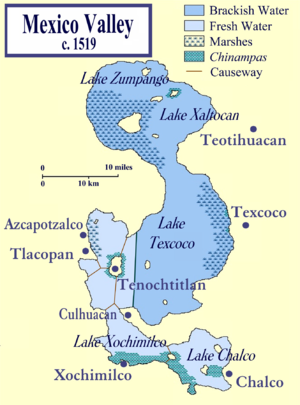 Texcoco was founded in the 12th century, on the eastern shore of Lake Texcoco, probably by the Chichimecs. In or about 1337, the Acolhua, with Tepanec help, expelled Chichimecs from Texcoco and Texcoco became the Acolhua capital city, taking over that role from Coatlinchan. In 1418, Ixtlilxochitl I, the tlatoani (ruler) of Texcoco, was dethroned by Tezozomoc of Azcapotzalco. Ten years later, in 1428, Ixtlilxochitl's son, Nezahualcoyotl allied:xxxviii with the Mexica to defeat Tezozomoc's son and successor, Maxtla. Texcoco and the Aztecs of Tenochtitlan, with the Tepanecs of Tlacopan, subsequently formalized their association as the Triple Alliance. However this was an uneven alliance as Tlacopan entered the battle against Azcapotzalco late. Texcoco thereby became the second-most important city in the eventual Aztec empire, by agreement receiving two-fifths of the tribute collected while Tlacopan received one-fifth. Texcoco was known as a center of learning within the empire, and had a famed library including books from older Mesoamerican civilizations. Greenstone sculpture of a snake, from the National Museum of Anthropology. Erected by the hill of Texcotzingo, the royal residence had aqueducts, baths, gardens, stairways and over 300 separate chambers. The palace gardens were a vast botanical collection that included plants from not only the growing Aztec Empire but also the most remote corners of Mesoamerica. Remnants of the gardens still exist to this day and have recently been studied by a team of Discovery Channel scientists, who were able to demonstrate by means of modeling and computer simulation that the layout of the site had been carefully planned to be in alignment with astronomical events, with an emphasis on Venus, and not simply aligned with the cardinal directions as previously assumed. The water used to irrigate the gardens was obtained from the springs beyond the mountains to the east of Texcoco. The water was channeled through canals carved into the rock. In certain areas, rock staircases were used as waterfalls. After clearing the mountains, the canals continued downhill to a point a short distance from Texcotzingo. There the path to the city was blocked a deep canyon that ran from north to south. Nezahualcoyotl ordered that the gap be filled with tons of rocks and stones, thus creating one of the earliest major aqueducts in the New World. The whole hill of Texcotzingo was also served by this canal system and converted by his designers into a sacred place for the rain god Tláloc, complete with waterfalls, exotic animals and birds. On the summit of the mountain he constructed a shrine to the god, laid out in hanging gardens reached by an airy flight of five hundred and twenty marble steps, a significant number, since according to Aztec mythology the gods have the choice to destroy humanity once every 52 years. Xolotl was said to be the founder of Texcoco in 1115 AD and reigned until 1232. He was followed by Nopaltzin (1232–1263), Tlotzin (1263–1298), Quinatzin (1298–1357), Techotlalazin (1357–1409), Ixlilxochitl (1409–1418), Nezahualcoyotl (1420–1472), Nezahualpilli (1472–1516), Cacama (1517–1519), Coanchochtzin (1520–1521), and Don Fernando Ixtlilxochitl (1521–1531). Nezahualcoyotl (1403–1473) was a noted poet, philosopher, and patron of the arts. He also had a large botanical and zoological garden, with specimens of plants and animals from throughout the empire and from the more distant lands with which the Empire traded. Nezahualcoyotl's son Nezahualpilli (1464–1515) continued the tradition of patronizing the arts. 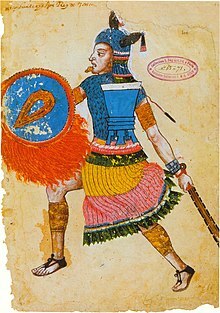 In 1520 the troops of Hernán Cortés occupied the city and killed Cacamatzin, Nezahualpilli's son and the last independent tlatoani, installing Ixtlilxochitl II as a puppet ruler. Cortés made Texcoco his base and employed Texcoco warriors in the Siege of Tenochtitlan. A descendant of the royal line, Fernando de Alva Cortés Ixtlilxochitl was an official during the colonial era and served as governor of Texcoco. From 1827 to 1830, Texcoco was the capital of the State of Mexico. ^ Smith (2005), p. 411. Smith, Michael E. (2005). "City Size in Late Post-Classic Mesoamerica" (PDF). Journal of Urban History. 31 (4): 403–434. doi:10.1177/0096144204274396. Wikimedia Commons has media related to Texcoco. This page was last edited on 2 February 2019, at 01:34 (UTC).